Cover art is credited on publisher page as Vincent DeFate. Forrest J Ackerman is listed as "Contributing Editor". All interior art is uncredited. Attributions here are from the artists' signature. "A Moment in History: Flight of Apollo Eleven" is listed as "Moment in History: The Crew of Apollo 11" in ToC. 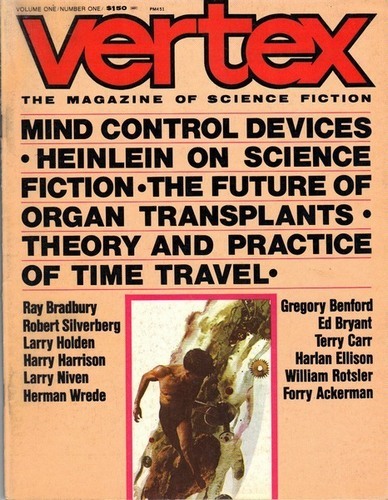 "The Discovery of the Future" is listed in the ToC as "Robert Heinlein on Science Fiction". "The Deadly Invasion" is listed in the ToC as "Deadly Invasion". "Dreamer of Tomorrow: Albert A. Nuetzel" is listed in the ToC as "Science Fiction Art Gallery: The Art of Albert Neutzell". The back cover consists of a full-page color photo of the Apollo 11 Moon landing.